One of the greatest pop pianists (along side Billy Joel), Elton John has written a slew of top-notch hits along with lyricist Bernie Taupin. Together, the duo has created pop classics that will go down in history and never be forgotten, always being re-discovered by music fans as they grow up and get the chance to hear what a brilliant tune-smith Elton John is, and how Taupin's lyrics bring the songs to life. 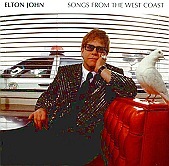 Elton John's latest, Songs from the West Coast is a continuation of his stunning career; it is an album that proves he's still got it. From the destined to be a hit "The Emperor's New Clothes", with its slow, simmering beats and storytelling lyrics, to the reminiscent bounce of "Original Sin," through "Ballad of the Boy in the Red Shoes," with its good time vibe and beautiful string arrangements, Elton John delivers a collection of stunning pop songs. What a way to ring in the new millennium. Elton John's pop sensibilities are still in tact, as is his ability to sing the lyrics in a way that only he can, in a way that turns the ordinary to the extraordinary. This is the work of a man both brilliant and filled with an endless well of creativity. While others' wells have long dried up, Elton John proves he's here for us until the day he decides to call it quits. I'll give this an A+.